Even though the subject matter of the book deals with his speculations on the evolution of human intelligence, this series of articles, should it manage to succeed in its aim, should serve the purpose of highlighting the veracity of his words. The fabric of the cosmos does present the human intellect with numerous challenges. As we unravel its umpteen layers, the excitement of having solved a mystery can be said to only marginally exceed the frustration at encountering new questions. In this mythical quest for secrets, as hope trumps disappointment, the cycle of discovery keeps reinventing itself as one puzzle replaces the next. In my last piece, I had tried to illustrate how the element of uncertainty is embedded in the very fabric of quantum mechanics. It is not of the kind we encounter in classical mechanics, where trusted laws can help us determine with absolute certainty which way a tossed coin will land. Uncertainty in quantum mechanics refuses to reveal its secrets beyond a certain ‘probability wave’, or more precisely wavefunction, that predicts the likelihood of the occurrence of an event. It is only when we interact with the system, with the intention of measuring some of its property, that this haze of multiple possibilities clears and assumes a definite outcome. Wave collapse. Image from University of Texas. Mathematically, this evolution can be said to have two distinct stages. 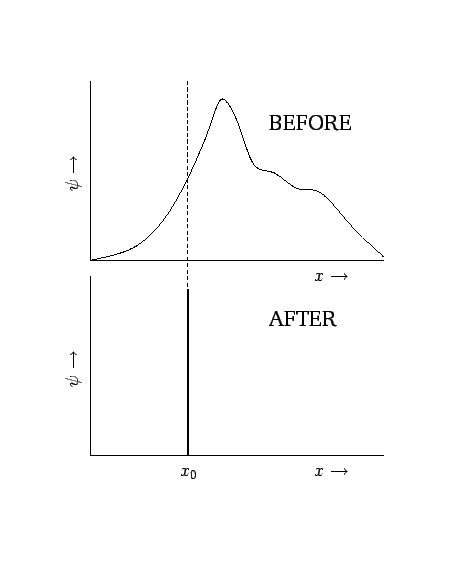 In the first stage, the probability wave of an electron (or some other fundamental particle) evolves over time—smoothly and gradually—according to Schrödinger’s equation. The second stage is when we make contact with the observable reality, causing the electron to snap to, let’s say, a particular position, thereby ‘collapsing’ the wavefunction. And therein lies the heart of our ‘problem’. The quantum mechanical description of reality is clueless about this collapse. According to Schrödinger’s equation, wavefunctions do not collapse. It is simply a convenient add-on that helps theory agree with observations (I have come to believe physicists often do that). 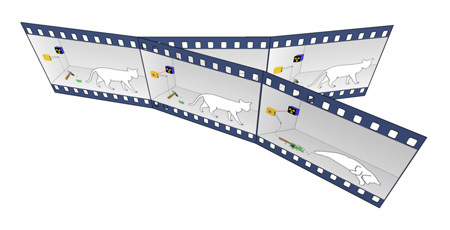 Since the cat is never observed to be both dead and alive, the explanation safely posits that the act of measurement causes the wavefunction to relinquish its state of quantum limbo and usher one of the possibilities into reality. But what is so special about the act of observation that causes this choice to be made? How are the different possibilities converted onto an actual, sharply-defined outcome? This dilemma is what’s known as the Quantum Measurement Problem and forms the core of several contending interpretations of quantum mechanics that seek to explain what has so far only been observed. Werner Heisenberg, who, along with Neils Bohr, formulated the Copenhagen interpretation, provides some particular useful insights regarding the nature of quantum reality in his book Physics and Philosophy. He writes, “Reality is in the observations, not in the electron.” This view is embodied in the Copenhagen interpretation which claims that a wavefunction is merely the mathematical embodiment of what we know about reality. Before we observe the electron, it exists in a ‘coherent superposition’ of all possible positions, snapping out of this haze when we measure its position. In this respect, the collapse is nothing more than the change in our knowledge about the whereabouts of the electron. What goes on behind the scenes, strictly speaking, lies beyond the scope of physics. Dead and alive. Image from Animals Have Problems Too. 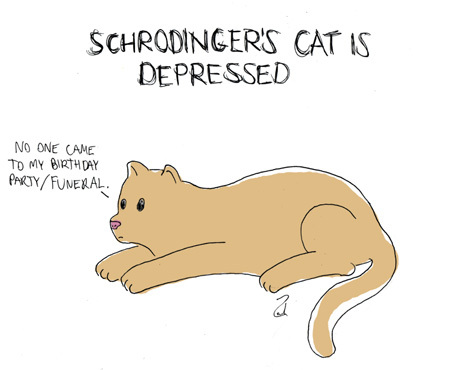 Crudely translated, this would imply that the cat is to be considered alive and dead at the same time! Naturally, this worldview, even though quite popular, does not sit well with a number of physicists and, yes, philosophers. Detractors question why fundamental physics should so closely be tied to human awareness. If we were not here to tinker around with laboratory equipment, would wavefunctions never collapse, or better still, not exist? Can bacteria or ants not be observers of quantum reality and a change in their ‘knowledge’ be associated with the wavefunction collapse? For several years, the Copenhagen interpretation of quantum mechanics held sway in scientific circles. But its primacy was challenged 1957 by an approach formulated by Hugh Everett that subjects our classical instinct to another major upheaval. (I seem to be getting into the habit of saying this. But, well.) The many-worlds interpretation (M.W.I.) denies the occurrence of the wavefunction collapse. Instead, it views reality as a multi-branched tree, where each possible quantum outcome is realised. The concept of the universe is enlarged to include an infinite number of ‘parallel universes’ within a larger multiverse so that anything that can happen actually does happen in one of the innumerable versions of our universe. In one universe you are reading these words while in another you are waiting anxiously for the grand gala opening of your first play. It’s all happening out there! Many worlds. Image from Wikipedia. Needless to say, I have only scarcely begun to realise the impact that this can have on our understanding of not only science but widely disparate disciplines like philosophy and spirituality. What if I were to put a gun to my head and pull the trigger? Would I be able to pull off this ‘quantum suicide’? If M.W.I. is right, there will be a copy of our universe where I am alive and well. Should that mean my consciousness is, in essence, immortal? Quacks have been quick to jump on this bandwagon and have sought to use M.W.I. to give credence to the idea of a soul that defies death and simply changes its ‘vessel’ as it hops from one universe to the next. Maybe that is how our ancestors tried to comprehend the strangeness of the universe we inhabit. Who knows? But physicists are not in the business of mysticism and they have never really liked playing with odds. Some promising steps have been taken in the direction of separating spirituality from science through work on the phenomenon of ‘decoherence’. Decoherence provides an explanation for the appearance of the wavefunction collapse by postulating that much of the quantum weirdness of large objects ‘leaks’ from large objects because of their interaction with their environment. In other words, it is the framework which tries to explain how quantum uncertainty morphs into the well determined outcomes of classical experimental physics and our intuitive understanding of reality. M.W.I., with its decoherence updating, can prove to be an encouraging direction in the evolution of quantum theory.